Frank Oliver Howard was born on August 8, 1936 in Columbus Ohio. The six foot seven inch tall, 255 pound Howard was one of the biggest players of his era. Howard was an intimidating presence at the plate, and hit some mammoth career HRs. He attended Ohio State University playing both baseball & basketball. He was drafted by the Philadelphia Warriors of the NBA but chose to play baseball instead. 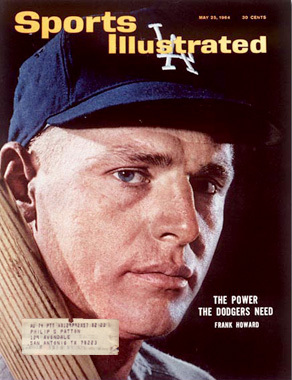 He signed with the Los Angeles Dodgers in 1958. He would earn the nickname of “Hondo” after a character in a John Wayne film. After two brief appearances he became a regular in 1960 replacing Carl Furillo as the Dodger right fielder. He was the NL Rookie of the Year hitting 23 HRs with 15 doubles 77 RBIs batting .268 although he did strike out 108 times. The next year he batted .296 but was limited to just 92 games, still hitting 15 HRs. In 1962 he had his best year in Los Angeles, hitting 31 HRs (7th in the NL) with 25 doubles 80 runs scored & 119 RBIs (5th in the NL) while batting .296. On June 30th he hit a HR against the New York Mets, in a game where Sandy Koufax threw his first career no hitter. He came in 9th in the league’s MVP voting that season, as the Dodgers & Giants tied for first place. A three game playoff was decided for the pennant, and Howard struggled going just 1-11 as Los Angeles lost to the Giants. The next season he hit 28 HRs with 64 RBIs (third on the Dodger team behind Ron Fairly & Tommy Davis) batting .273 as the Dodgers went on to win the World Series behind the pitching of Sandy Koufax & Don Drysdale. In the World Series Howard hit .300 (3-10) blasting an upper deck HR off Whitey Ford in the last game of the Dodgers Series sweep. It would be big Frank’s only post season appearance in a 16 year career. In 1964 Howard hit a three run HR on June 4th at Philadelphia’s Connie Mack Stadium leading L.A. to a 3-0 win in Sandy Koufax’s third career no hitter. Howard had another 20 plus HR season in 1964 but his batting average dropped off to .227 and he drove in 69 runs, striking out 116 times. It was his third straight season of 100 plus strike outs. After the 1964 season he was traded with three other players to the Washington Senators for Claude Osteen and $100,000. He would spend seven years in Washington D.C. earning the new nickname of “the Capitol Punisher”. Howard became one of the league’s biggest sluggers & most feared hitters. He hit over 20 HRs six times, including three straight seasons of 40 plus HRs. His first three seasons there he played for Gil Hodges, hitting 36 HRs third in the league behind Harmon Killebrew & Carl Yastrzemski. He also led all left fielders in fielding before switching to first base the next season. In 1969 he gave up his uniform #9 when the Senators hired Ted Williams as their manager. Williams taught Howard how to be more patient at the plate, go deeper into the count & draw more walks. In 1968 Howard led the American League in HRs (44) extra base hits (75) slugging % (.52 %) averaging a HR every 13 times up at bat. He was second in league in RBIs (106) and made his first of four straight All Star teams. During a stretch in May, Howard hit ten HRs in one single week, over a period of just twenty at bats. No one has ever come close to topping this feat, in baseball history. He also had a stretch of one HR in six straight games. 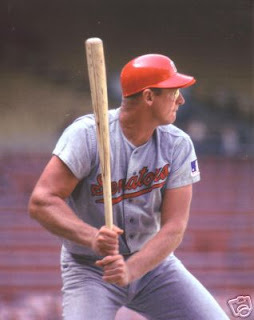 In 1969 the Senators had their only winning season during Howards time there, he bashed 48 HRs (second to Harmon Killebrew) with 111 RBIs (second to Reggie Jackson) leading the league in intentional walks (29), with 60 extra base hits, & a career high .574 slugging %, while batting .296 matching a career best. He increased his on base % to .402% as he doubled his base on balls from the previous season to 104 walks. In 1970 he led the AL in HRs (46) RBIs (126) & walks (132) posting a .416 on base %. 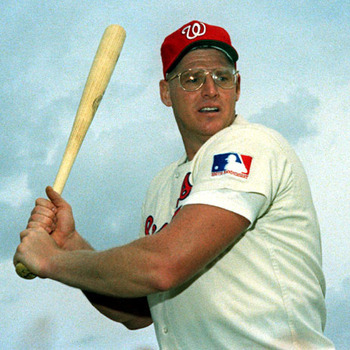 He hit 237 HRs in a Washington uniform the most by any player and his 1969 totals are all around season bests by any Senators Player in history. In his last at bat at RFK Stadium he hit a massive HR off Mike Kekich of the A.L. New York team, a pitch called by Ralph Houck as a gift to the big man. He thanked the catcher when he touched home plate, threw his helmet into the crowd & said it was his biggest thrill in his playing career. The Senators moved to Texas and became the Rangers; Howard struggled in the team’s first year in Arlington batting just .244 with 9 HRs in 95 games played, and was soon released. At age 36 his career was winding down, he finished his last two seasons in Detroit by 1973. On September 8th he hit his final career HR at Fenway Park against the Boston Red Sox, he had hit a Hr in his previous game three days earlier as well. He finished up his 16 year career with 382 life time HRs (59th All time), 1119 RBIs (186th all time), 1774 hits 245 doubles 35 triples 783 walks 662 extra base hits (202nd all time) and a .273 average with a .352 on base %. He struck out 1460 times putting him 56th on the all time K list. Retirement: After his playing days, he first coached under George Bamberger in Milwaukee with the Brewers from 1977-1980. He then managed the San Diego Padres during the strike shotened 1981 season. He then came over to the New York Mets as a coach with Bamberger in 1982 as the Mets batting coach. After Bamberger resigned in 1983 Howard was named the tenth manager in Mets history. 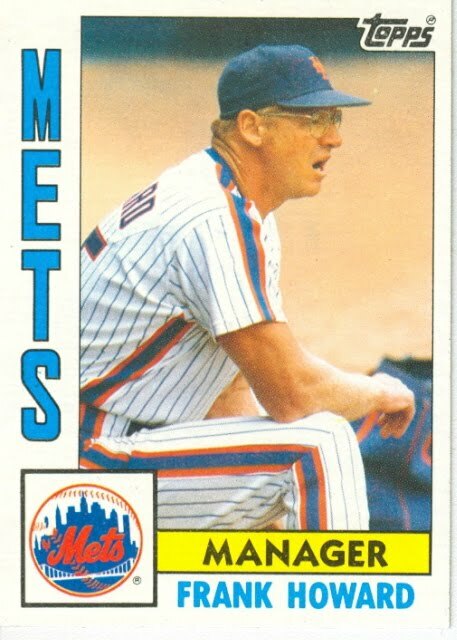 He basically was just an interim manager, who didn’t have much to work with especially in the pitching department. 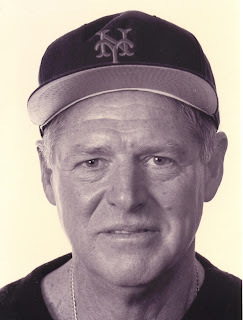 He took over the team on June 3rd 1983 in Los Angeles with the team in 6th place, 9 ½ games back. In his first game, the Mets beat Tommy Lasordas Dodgers 5-2 as Ed Lynch earned the victory. The Mets would win two out of three in Los Angeles but faltered from there. They did give Howard two four game win streaks in early August, winning eight of nine games, their best streak under his tenure. 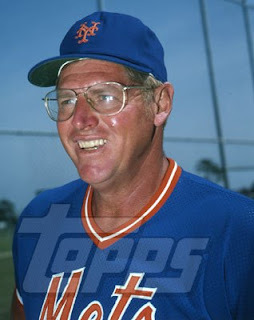 His Mets finished in last place, as the team went 52-64 in 116 games under his watch. Although on a positive note, Daryl Strawberry was inserted in the lineup permanently winning the rookie of the year award, & the Mets acquired Keith Hernandez that June under his watch. 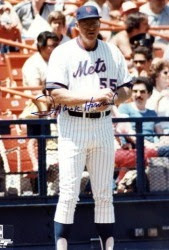 He was replaced by Davey Johnson the following season (1984). 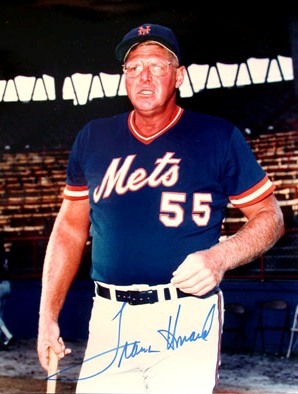 Howard was known as being a gentle giant, a nice guy who always appreciated the fans. 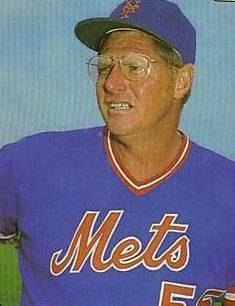 Howard returned as a Met coach in 1994-996 under Dallas Green & later Bobby Valentine. He remained an active coach with the AL New York team, the Seattle Mariners & Tampa Devil Rays. He also worked in player development in the 2000s. Honors: When baseball came back to Washington D.C. with the Nationals, the Big Man was honored again, and regularly appears at baseball functions in the area. He also is involved with a lot of charity work at children’s hospitals in the D.C. area. 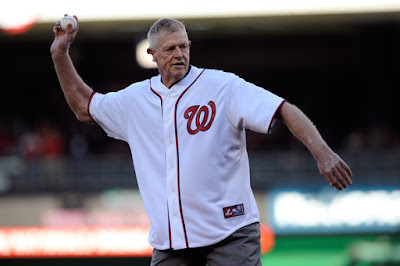 In 2014 he threw out the ceremonial first pitch at the NLDS vs the St. Louis Cardinals.